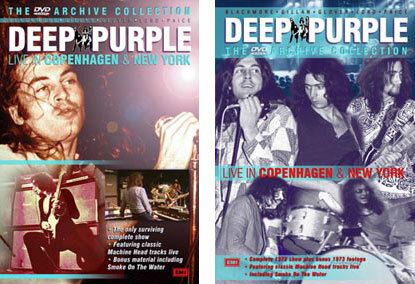 The producers of the upcoming Deep Purple DVDs at T2 have allowed us permission to post exclusive previews of the releases on www.deep-purple.net to give fans an idea of how the finished product is shaping up. Please understand that these images are work in progress and are likely to change. Also we have been asked to point out that this material is all subject to copyright clearance so please do not copy the images. For up-to-date news on the dvd, see our Mk.1-7 news page. This is designed to feature on the packaging and on screen, and link the releases. 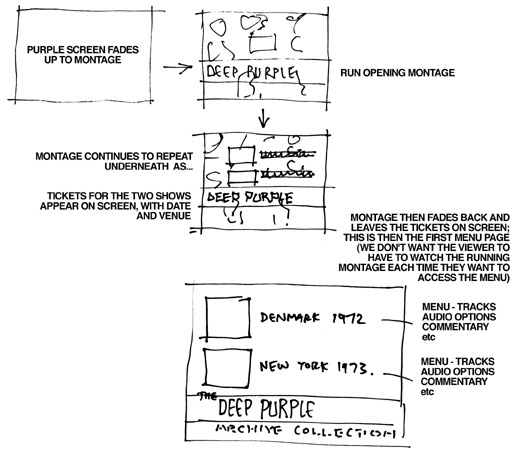 This sketch shows how the various elements of the intro to the DVD should interact. Showing how the main on-screen menu page is looking. Showing how one of the on-screen menu pages is looking. Showing how the on-screen credits page is looking. An opening animated sequence of multi-layered images designed to encompass the early line-ups and be used on all the archive releases. Two work in progress designs. The final design front and back covers. Quick time files are also playable in RealPlayer. and America by Eagle Spitfire. DPAS mail order are taking advance orders for the UK version. Text, video & photos © 2005 T2Media. 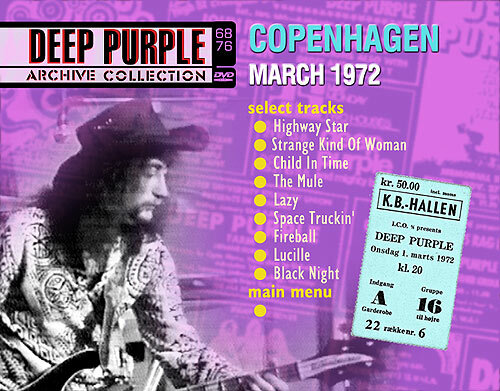 The first section was filmed in the Danish capital Copenhagen on March 1st 1972 at the The Københavns Boldklub sports centre. Only an excerpt from the show was screened, and it was not until the early eighties that the full show came to light again. A video was issued in 1987 in Japan only - titled "Machine Head Live". 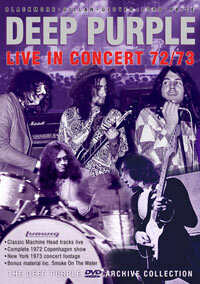 Three years later it came out in Europe as "Scandinavian Nights : Live In Denmark March 1972". Japan later issued the concert on laser disc and then DVD. For this release, the first on DVD outside Japan, the producers had access to the original video reels to enable the very best quality digital transfer. 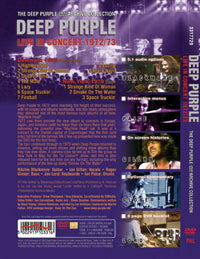 This film represents, as far as is known, the only complete visual document of a Deep Purple Mk 2 concert. The second section was filmed in the concert hall of Hofstra University, a large campus in New York State, on the 28th or 29th May 1973. A 25 minute segment was edited down for the American TV show "In Concert" and screened in July. Sadly the rest of the footage was not kept. This is the first time the entire surviving footage has ever been released and is the only time Mk 2's seminal number "Smoke On The Water" was caught on film. By the time of this show Ian Gillan had handed in his notice and a month later the Mk 2 line-up disbanded. Denmark / New York DVD : Proposed audio options. The audio on the Denmark and New York shows will be available in three options. Stereo : this is the original format. new technology allows 5.1 to be generated from stereo. It's obviously not the same as mixing from a multi-track source, but does give very acceptable results.